Expect Miracles Foundation – Financial Services Against Cancer recognized the significant contributions of Michael Collins and Terence Faherty from Broadridge Financial Solutions, Inc., by naming each the recipient of the Expect Miracles Award in 2017. The Expect Miracles Foundation’s young professionals group, YPEM, has had a remarkable 2017. This year welcomed many new firsts, including: the first NYC Kan Jam Tournament, the first time at a new venue for the Boston Kan Jam, the first ever spin event, and most importantly, the first time raising over $60,000. With that funding, YPEM has raised over $100,000 since its inception in 2014. 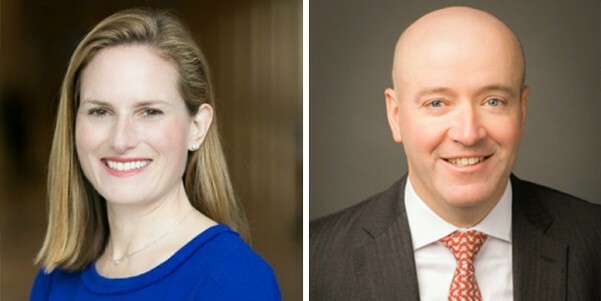 Boston, MA – September 28, 2017 - Expect Miracles Foundation’s Board of Directors has appointed two financial industry veterans as Directors, Christine Gill, Managing Director, Head of Investor Solutions & U.S. Financial Institutions at BNY Mellon, and Michael McKeigue, Managing Director, Head of Strategic Accounts at Tortoise Investments. Boston, MA – September 19, 2017 - Expect Miracles Foundation – Financial Services Against Cancer recognized the significant contributions of Kate Richman, of Financial Recovery Technologies, and Brian Rudenauer, of State Street, by naming them recipients of the YPEM Award. The YPEM Award (Young Professionals Expect Miracles) is given in recognition of a young professional whose exceptional contribution of time, resources, and energy rallies the next generation of financial executives to support the life-saving mission of Expect Miracles Foundation. Want to share your story? Contact Frank Heavey at 978.760.4352 to learn more about writing for us! Make a contribution to the fight against cancer today.